NEW YORK, NY.- The Morgan Library & Museum announced today the acquisition of an extremely rare manuscript leaf by the finest and most original illuminator of the Dutch Middle Ages, the Master of Catherine of Cleves. The work is from an otherwise lost Book of Hours and is the first to be discovered by the artist since 1980. The Master of Catherine of Cleves was active in Utrecht, the Netherlands, from around 1430 to 1460. He is named after his masterpiece, the Hours of Catherine of Cleves, which is part of the Morgans collections, and only fifteen of his illuminated manuscripts survive. 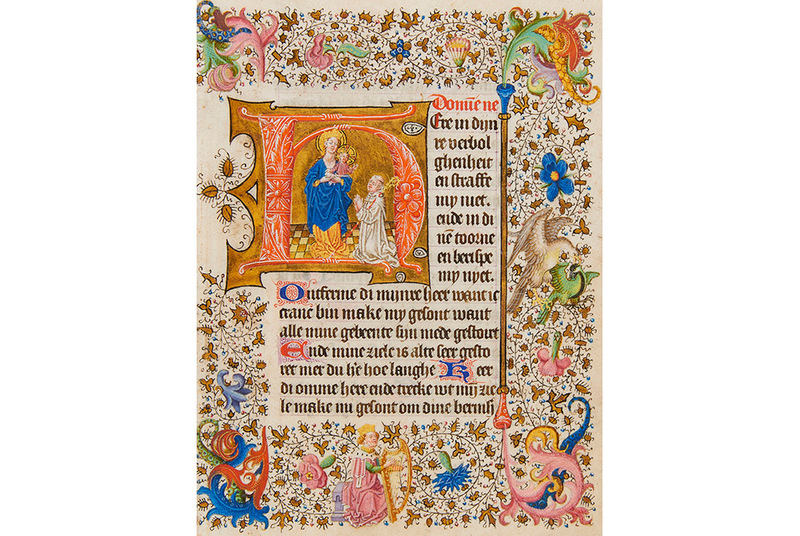 The newly discovered page contains the beginning of the Seven Penitential Psalms, written in Dutch, and the artist framed the text in an elaborate gold and foliate border. Figures depicted in the leaf include the Virgin Mary offering her milk to St. Bernard, David playing the harp, and two fighting birds. Beginning April 17th, the illumination will be added to the current exhibition on view at the Morgan, Now and Forever, The Art of Medieval Time, which runs through April 29. The show is curated by Roger S. Wieck, the Morgans Melvin R. Seiden Curator and Department Head, who recently discovered the new leaf at a European auction house, which did not recognize that it was the work of the Cleves Master. In 2010, Mr. Wieck organized a critically acclaimed exhibition at the Morgan on the Hours of Catherine of Cleves. Visitors will be able to compare the new leaf to the Hours of Catherine of Cleves, two volumes of which are on view in the current exhibition. The Master of Catherine of Cleves decorated books of private devotion for wealthy and noble families and illustrated liturgical books and Bibles for members of the high-ranking clergy. Stylistically, the new leaf suggests the late phase of the artists career. This is evident in the thick, angular drapery, the muscular facial features of the Virgin Mary, and the border design and layout.